Agamemnon, believing he is acting out the wishes of the gods, sacrifices his eldest daughter for success on the battlefield on the eve of her wedding day. His wife, Clytemnestra, cannot forgive such a betrayal, and silently seething, plots his downfall. Her actions force her down a dark path and her choices have far-reaching consequences for her, her remaining children and their kingdom. This is a retelling of a classic Greek tragedy, full of scheming, revenge and murder. I must admit that I haven’t read the original text. While I’d heard of a couple of the key players, I didn’t know the story, so have nothing to directly compare this to. As events unfold, all of the characters find themselves stuck in a cycle that seems impossible to break. With each crime committed or action taken, there’s another character waiting in the wings to demand payback or retribution. Although this is set in ancient Greece, there are themes running through this book that are entirely relatable to the present day – such as Clytemnestra’s loss of faith, her grief and her feelings of abandonment by a higher power after a tragic loss. Revenge and the idea of ‘an eye for an eye’ also still resonates. Although the actions of Clytemnestra and those around her are extreme and melodramatic, the motivations behind them are understandable in the context, if not forgivable. Despite the high emotions that the characters must feel, the writing style feels quite distant and detached. Clytemnestra is the only one that I felt any real attachment too. Her emotions shine through and I wish we’d had more from her point of view. Her actions reverberate through the palace, affecting everyone around her. This includes her daughter Electra, who brims with silent fury. Electra eventually becomes what she despises – another example of how without change, everything comes round in a circle and no progress is made. Orestes was an interesting character. He’s continually being pushed in various directions by other characters, such as Leander and Electra, but never fully included. His sense of isolation is echoed in the rest of the novel – everyone has their own secrets and motivations and they’re not willing to share them. The result is a general feeling of mistrust and suspicion, summing up the pervading overall feel of this book. While I didn’t dislike this book, I can’t say that it really provoked any strong emotions in me either way. It was quite an interesting read though, and I did enjoy learning more about the Greek myths. The story: In the near future, the polar ice caps are melting, the transpolar shipping route is being heavily utilised and individuals and countries are jostling for power and control. When a cruise ship searching for an increasingly rare glimpse of the elusive polar bears travels into the restricted waters of the Midgard Lodge, they get more than they bargained for when a calving glacier reveals the preserved body of a man. The Midgard Lodge is a private retreat run by businessman Sean Cawson, and the body discovered is that of his long-time friend, business partner, and ex-Greenpeace activist Tom Harding. The discovery of Tom’s body starts an inquest into the events that led to his death, led by his friends and family, while Sean also faces an internal struggle that is increasingly difficult to contain. My thoughts: Much of the novel focuses on Sean’s character development. At the beginning of the novel, he is presented as a selfish opportunist taking advantage of the people around him for his own personal and monetary gain. I feel like as we got to know him more we were supposed to see that there was more to his character, but for me this never really happened. I couldn’t connect with him as a character. He wasn’t likeable and I struggled to see his redeeming features. I think as a character though, he was written really well and came across as totally believable. The environmental message is one that is impossible to escape from. At the end of the book, I wasn’t thinking about the characters or their stories, I was thinking about the trans-polar route, global warming and capitalism – and the future of the world as we know it. There are two conflicting viewpoints set out here – those who can see the damage that is being done to the environment and want to slow it or stop it as best they can, versus those who can see that change is coming no matter what and believe they may as well be at the forefront of progress. The descriptions of the Arctic from the early polar explorers talking about the hostility of the natural landscape, which precede each chapter, are sharply contrasted against commercialisation and modernity. There’s a real sense that the natural world as we know it is shrinking and dying, to be replaced by luxury hotels and convenient mod-cons. This conflict is brought to life through Sean and Tom’s personal story. Although I thought this was handled a bit heavy-handedly at some points, it is a valid and valuable debate and it certainly made an impression. Pacing was a bit of an issue in this book for me. I felt it really took some time to really get going. Until I got to around 50%, I was struggling to find a compelling reason to pick it back up. After this, the story does really pick up the pace, but if I hadn’t received a copy of The Ice for review, it might have taken me a while to get through it. Having finished it though, I’m glad I persevered. It was a really insightful and thought provoking read. 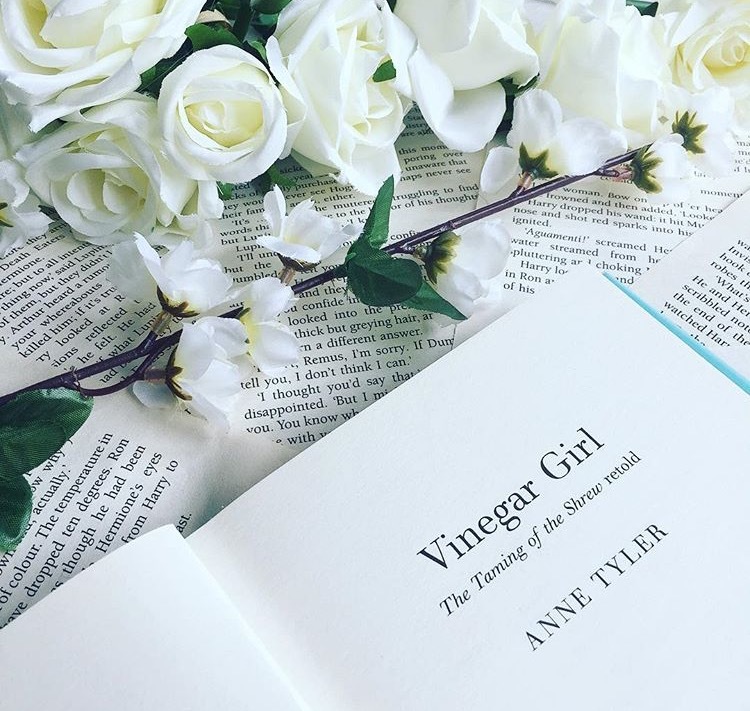 I recently read Anne Tyler’s Vinegar Girl, which is based on The Taming of the Shrew and part of a series of books that aim to bring Shakespeare plays into the modern age. It lead me to think about whether Shakespeare can ever be truly updated, or if our values are just too different. The Taming of the Shrew is widely considered to be one of Shakespeare’s most controversial plays, due to how women and gender roles are portrayed, and while this plot may have appealed to the Elizabethans, it doesn’t immediately seem like it’s one that would translate to a modern audience. Before writing this review, I also read the original text of The Taming of the Shrew. Essentially, the story involves a father marrying off his outspoken elder daughter, Katerina, to the first man that comes along, Petruchio. Interested only interested in her dowry at first, Petruchio, often described as a ‘madman’, then resolves to ‘tame’ Katerina. He proceeds to give her a taste of her own medicine by bullying and berating her at every turn, until she agrees to submit to him in every way – even believing that the sun is the moon if he says that it’s so. She then gives a long final speech about wifely duty and obedience. I’m sure there are more complex ways to interpret this play, but I won’t go into them here. How does Vinegar Girl compare?